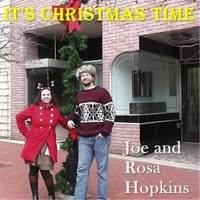 Joe and Rosa Hopkin's double-disc Christmas album is sure to please and is nonstop F-U-N! Drawing on several hundred years of Christmas musical tradition, as well as newer styles like alternative and punk, this album pulls out all the stops for this year's Christmas celebration. Whether it's an authentic-styled Celtic piece or a song you could sing while sleigh-riding through Appalachia in the mid-1800's, one thing is sure -- the Christmas story and Jesus Christ are the main focus. Joe and Rosa Hopkins' first album, 'Give Me A Song To Sing' is a country/gospel album which is available for free download on CdBaby. Their sophomore album, 'Salvation Songs' is also available for free on CdBaby and is Alternative Christian Contemporary. Both Joe and Rosa Hopkins play guitar, banjo, ukulele, harmonica, mandolin, as well as some violin and piano. Their original songs feature heavy use of Scripture with the gospel as the focal point. They give God all of the glory for what He has done and is doing through them.